In 7115 Knut Skogrand of Norway returned again this year with his ultra-luxury class Skogrand Beethoven cables sheathed in light silk brocade, though other rich colors are available. The cables use Ultra Pure Ohno Continuous Cast copper and the strands are scanned to insure there are no grain borders in the given length. 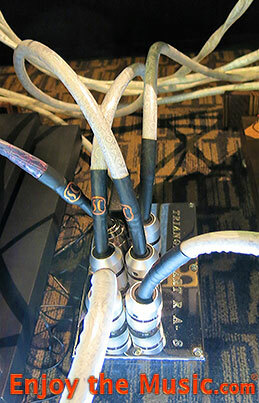 The power cords were all plugged into a Triangle Art RA-8 power conditioner. 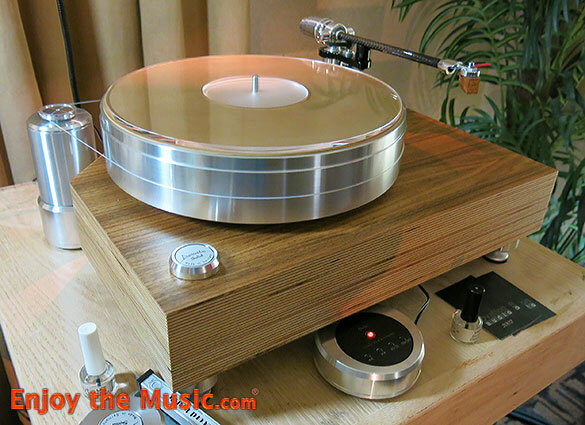 The amplification this year was tube gear from Triangle Art, a California company, including their Reference Line Stage and Phono Stage (both with separate power supply) and Reference monoblocks, all of which were resting on Krolo Design stands. 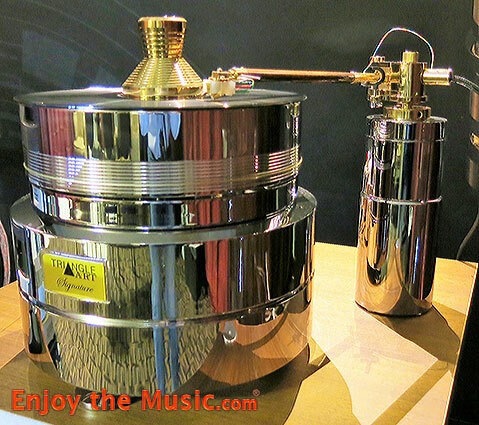 Triangle also supplied two turntables � their stunning Signature model and their more modest Symphony, both equipped with their Osiris wood tubed tonearms. 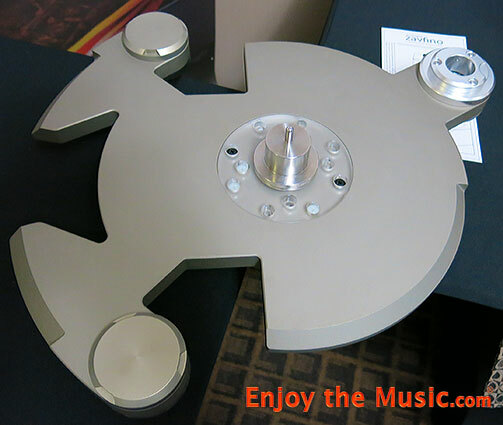 The Signature featured their Apollo MC cartridge and the Symphony featured their Zeus MC. The speakers were also new this year � the Venture Ultimate, a three-way design with first order crossovers and three graphite composite woofers that handle music down to 26Hz. The jazz playing here was not terribly demanding music, but it was very nice to listen to � noticeably better than last year's system which was comprised of a conglomerate of different brands. With 160 Watts coming from four KT-88 tubes run in Class A and in ultralinear mode, they could easily have driven the 90dB/W/m sensitive speakers much louder, but in fact, even in this small room, the large speakers sounded great � not a small feat. I had been warned about sugar cubes at a much earlier point in my life. And I had been given a "heads up" on this one here at the show in the Sweet Vinyl room (7121), but I wasn't expecting such a modest rig. There are two Sugar Cube models: SC-1 ($1500 USD) and SC-2 ($2500 USD). But they are doing an Indiegogo for the next three months so you can get a deal as they launch their company. 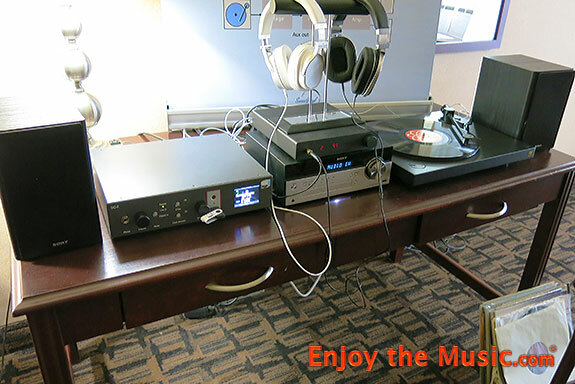 The first is a sophisticated digital click and pop removal device to install between your phono stage and your preamp that does a pretty incredible job of cleaning up a worn LP without losing any music in the process � as best I could tell with the inexpensive system here. The SC-2 does the same and adds a digital output to store the results and sources meta data from the internet and shows it to you on your phone (or tablet?). It also has a built-in headphone amp for personal monitoring. Way cool, especially if, like me, your record collection comes from garage sales instead of 200 gram vinyl remasters. Whether it is a "must have" item for someone with an expensive turntable, cartridge and record cleaning machine remains to be examined. 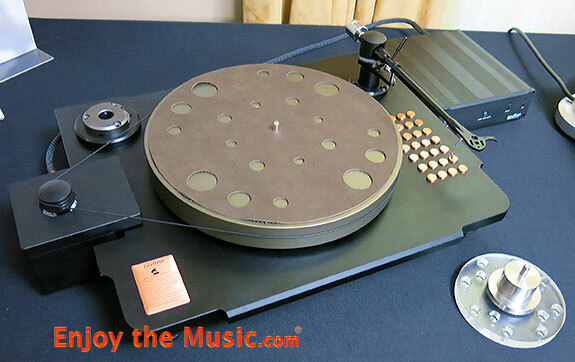 I've found that with my VPI 16, a hot-rodded Linn and a cartridge close to a four-figure price, the clicks and pops get drastically reduced in number and minimized in distraction because they are reduced in volume and shorter in duration. I've learned to listen through them, but wouldn't it be nice not to have to? From my brief exposure here, the Sugar Cube is all up-side. 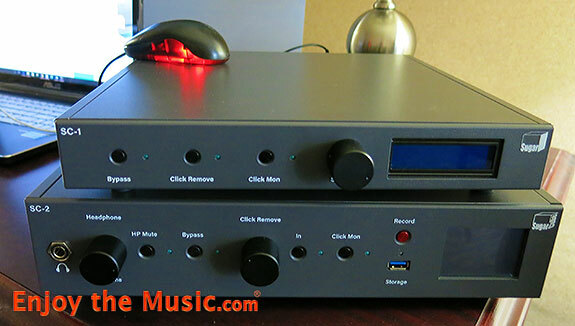 The phono signal from the 111 was sent to an Acoustic Solid MM/MC phono stage ($1800) and to the Hegel preamp mentioned above. Off to the side in this room was an Acoustic Solid 113 Bubinga turntable package for $4200 that came with WTB 303 tonearm with an unspecified cartridge. The Bubinga was a veneer over MDF. 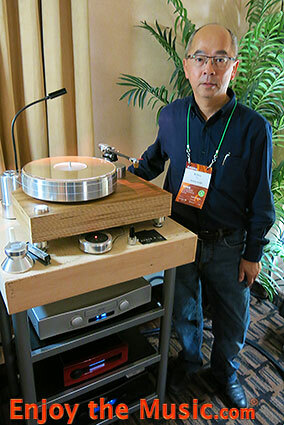 There was also a Hegel CDP2A CD player ($2700) that some of you might have heard. The soft female vocal I heard on the MPX wood turntable was not demanding and the rig sounded very nice at a modest volume. (It was Sunday morning at this point in time, so easy listening was on the agenda of a lot of presenters.) 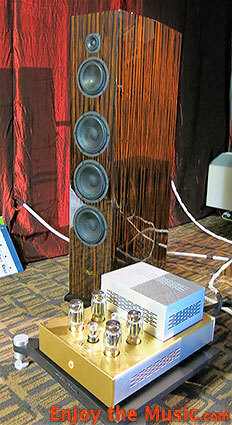 Likewise, ProAc speakers have always been very easy to listen to for me and this room was no exception. 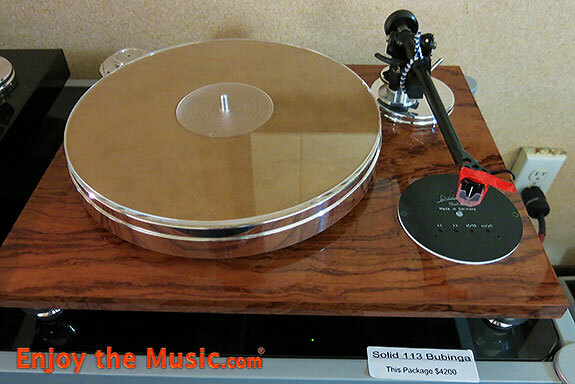 Being a furniture guy, the Bubinga wood plinth of the Acoustic Solid 113 was beauty to behold. They used a clear acrylic top layer with a leather mat under that to isolate the acrylic from the metal. Both turntables seem to be new models not listed on their website. If these don't appeal to you, check out the Acoustic Solid website where they show dozens more in the Classic (wood) and Metal categories that are sure to cover a wide range of prices. Across the hall in 7126 was the Zavfino 1877PHONO room where I met the principal person, Will Tremblett who started out making cables, then gravitated to phono cables and is now involved as a turntable manufacturer as well. They have 73 products mostly based around vinyl. One of their high volume products is DIN cables for the DIY crowd and OEM market for other manufacturers. The brass buttons on the first photo are adjustable / removable to allow you to tune the plinth. And the acrylic and aluminum spindle insert in the lower right corner was their way of isolating the bearing from the aluminum plinth without having to go to an expensive all-acrylic plinth. The power supply in the upper right corner of the photograph is adjustable and it is set up with piece of magnetic tape applied to the platter that is read by a hand-held reader that reads out to four decimal points. Once the power supply is set up, the speed adjustment is set in memory. I suppose, for greater accuracy, you could do this while actually playing a record, but I wondered how fluctuations in voltage might affect subsequent usage. I'll have to ask next time. This table was 180 degrees away from the artistically painted plinths I saw here last year � a few of which were still on display. The record matt seen here was die cut out of real leather (as I recall) and was a popular purchase at the show for Will. You also see him holding up another plinth design that can hold three tonearms, including a 12" arm when an adapter is employed. 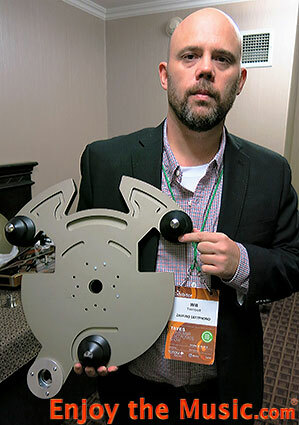 Zavfino is definitely a company to keep your eye on in the coming years. This was one of the most fun rooms at the show, but I was under pressure to get on to the Sheraton and visit the larger rooms. I look forward to seeing him again.